TYCO-700: 9.6 volt 700mAh rechargeable battery for RC models. Includes TAMIYA connector. Fits many different RC toys, including cars, boats, tanks, dinos, pets, etc. Charges up with supplied charger for 9.6v, OR with our SPEED CHARGER (sold separately). 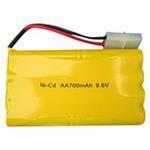 These battery packs are made by US in the U.S.A., using premium-grade SANYO cells. Dimensions of battery pack: 4" long, 2.25" across, 0.6" thick. IMPORTANT NOTE: Typically, the wall chargers supplied with your RC toys will NOT shut off by themselves. After you hook up the battery to the charger, they need to be unplugged after the appropriate charging time. SPEED CHARGER is a 110-120VAC Wall charger for 9.6v battery packs. Has TAMIYA mating connector. Charges battery packs in 3 - 6 hours. MUST BE UNPLUGGED AT END OF CHARGE CYCLE ! TYCO 9.6 volt 1100mAh Ni-Cd battery pack for R/C, TYCO-style, with TAMIYA conn.
TYCO-style 700mAh Ni-Cd rechargeable battery pack AND companion SPEED CHARGER. Battery pack has TAMIYA connector; wall charger has TAMIYA mating end. Charges battery in about 3 hours! PACKAGE DEAL: TYCO-style 1100mAh LONG LIFE Ni-Cd rechargeable motor pack AND SPEED CHARGER. Pack has TAMIYA connector; wall charger has TAMIYA mating end. Charges battery in 4 hours! Save $2.95 when buying pkg.